Photo credit: ismael villafranco, CC BY 2.0. Even though it was twenty-two years ago, I remember that meal at a Bennigan’s outside of Buffalo, New York, distinctly. One was the dessert: I ordered a slice of Death by Chocolate™, and it was served on a dirty plate. My first bite was chocolate plus a single strip of freshly dishwashed sautéed onion. Ice cream cake plus soap plus onion is a taste that lingers. What was missing from the end of the phrase: over money. A marriage is never a simple narrative. My father’s version of that narrative probably involves a Excel spreadsheet budget, each dollar carefully marked for tuition or retirement or braces or home repairs. My mother’s narrative likely mentions what it feels like when your partner delivers an itemized budget and expects you to comply. My parents were married for twenty-six years; they raised two kids, worked full-time, and probably enjoyed each other’s company at some point. They just never found a way to spend money on things they both valued — and they never modeled how to have a conversation about what a family values, and how to create a budget on those shared values. Food and money became intrinsically linked in my mind, maybe because food was both tangible and quickly consumed. College tuition and 401(k)s were abstractions. Braces: painful abstractions. Food was served three times a day, and so it became an easy place for me to learn about what things cost and how to save money. Early on Saturday mornings, my father and I would hit up Wegmans, and it was during those trips that we would talk about how to cook, how to plan a week’s worth of dinners, how to shop for ingredients and not just meals. Between those trips and the Bennigan’s incident, I was starting to piece it together: eating out was a huge waste of money. Anyone, with enough practice, could make their own pizza dough or grill salmon or scramble up an egg. Despite the tension that hung over that suburban house, we still gathered every night to eat dinner together as a family, and though those meals were simple, they did not Cost a Lot of Money. Therefore, they were good. Which is why 1996 me might be surprised to learn that my husband Ben and I eat out at least three times a week. And that despite doing so, we can still pay our mortgage. Perhaps most surprising, however, would be that in our marriage, we actively talk about money and what we value spending it on — together. As it turns out, one of the biggest items in our budget is food, and half of that budget is set aside for meals or drinks out. There are some disclaimers, of course. For starters, Ben and I are pretty frugal in other aspects of our lives. We share one paid-off Honda and live two miles from work. We don’t shop for clothes often, most of our vacations are one-day roadtrips to see bands, and we live in an area of the country with an extremely low cost of living. (A lot of our meals out consist of happy-hour-priced apps and $1.99 draft craft beers. Friends from out of town often laugh at Statesboro menu prices.) We are also childless, and likely will remain that way, so the line items from my parents’ budget about braces and college tuition may never apply. While our budget discussions have sometimes been challenging, and it took us many years of tweaks and talks to figure out a budget that works for us, it is also easier to do so when the conversation does not include daycare. We also entered our marriage with almost zero student debt. We were both raised by parents who encouraged us to attend in-state schools, which we attended on academic scholarships while also working part-time, meaning that each of us graduated from undergrad debt-free. Even when we met in grad school, both of us worked food service jobs during our MFA program to supplement our teaching assistantship stipends. We joke that flipping eggs and waiting tables at Applebee’s during those years kept us humble. What it really meant is that we haven’t had to include student loan payments into our budget. Being raised by fiscally literate parents who were able to navigate our respective educational experiences has had a significant ripple effect on our lives twenty years later. It is that privilege that permits us now to spend a few nights a week at a restaurant, chatting with friends. Or the same that lets me spend so much of my time thinking about food as self-care, as fun project, instead of a necessity that needs to be secured. Food, as it turns out, is incredibly complex — as are the ways we navigate it. Right now, food consumes a lot of my mental space. I’m currently at work on a book-length essay about the coney-style hot dog, which means I think about hot dogs at least once a day. I would never call myself a foodie, since the word carries problematic connotations. I also don’t think cooking three meals a day from scratch is for everyone (which is why I don’t). Buying ingredients requires access and time, as does the act of cooking. There are many people for whom these things are largely inaccessible, and so I never want to deride convenience meals or fetishize “whole” food in the face of those problems. Cook your own food — if you want to, and if you can. Instead, I like to think of myself as fortunate enough to be a pretty decent cook, aiming to balance experimentation with pragmatism. Sure, I like taking on ambitious kitchen projects: making cheese, fermenting hot sauces, inviting over folks for a taco party featuring from-scratch tortillas. Still, as much as I like to geek out on the science behind a J. Kenji López-Alt recipe, or throw together a salad from our garden’s first harvest of romaine, I also like going to a restaurant and having someone cook and serve food to me. It’s not always the food; more often than not, it’s the ritual of the meal and what it represents. Food is the lens through which I view the world. It connects me to history and to science, grounds me to my past, reminds me of the person I want to be. It feels, to me, inherently human. I nearly failed my high-school chem course, yet I actively seek out detailed scientific explanations of how the protein structure of an egg affects its cooking. In writing about the chili dog last year for The Atlantic, I couldn’t help but view the story through the lens of American immigration. The act of sitting down at a table, even a table that is not my own, is a hugely valuable gesture to me, and one I get to engage with three times a day. Ben and I agreed to put half of our food budget towards meals out after discussing several reasons why it was a shared value. The social aspect tops the list: we live in a fairly small city in Georgia, and meeting friends for drinks and dinner is our primary social activity. Not only does it give us a chance to touch base with our friends, but I like seeing other folks we know from our university, our current and past students, and our community out and about. I grew up in a suburb that didn’t have any real sense of identity except for its good schools and golden retrievers; Ben grew up on a rural plot overlooking Lake Superior in Wisconsin. So it feels novel when we bump into the local herpetologist or women’s soccer coach. One of those meals planned into the weekly budget is for our Tuesday trivia nights, and I love our Tuesday trivia nights. There’s beer, and sometimes we even win. Socialization notwithstanding, dining can be a form of self-care for both of us. During the school year (we are both professors), we spend long hours each week talking to students about writing. These conversations, while incredibly valuable to us both, are also incredibly draining. Many nights we just want to crash on the couch and watch Hulu, in silence, until it’s time to go to bed at 8:30. Going out for a meal is a nudge for us to remain dressed, engage with each other, and talk about our respective days. There are no screens. There’s people-watching, there’s conversation, and there’s queso. 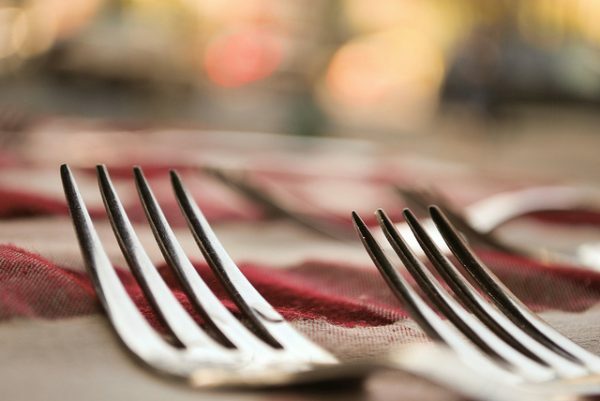 Dining out also helps keep the division of labor in our household feeling balanced. As much as I love to plan meals and grocery shop each week, I never want to feel as if it is my job alone. (This is not on Ben, who has never once made me feel this way — if I’m stressed, he’s the first one to suggest moving around the meal plan and going out instead.) Knowing that our meal plan includes three meals out keeps me engaged and productive in the kitchen, without turning that work — which I love — into a task. Do I sometimes wish that I were less Charles Boyle and more Captain Holt when it comes to food, fueled not by backstory but by practical Nutrition Bricks? Yes. It might mean that I could just, you know, eat the plate of rigatoni instead of thinking about the Columbian exchange. But this is how I think about the things we eat and what value we place upon those things. For Ben and I, at this point in our lives, we value being able to dine out. When our twenty-year-old HVAC system breaks down next year, we will adjust accordingly, cut down on a meal or two so we can replenish our savings account. But for now, we throw down that Chase Sapphire Reserve card, order the shrimp tacos, and raise our Sweetwater 420s to this life, which we are so lucky to have built together. Christina Olson is the author of Terminal Human Velocity, a book of poems about jumping off the Empire State Building and also Ernest Shackleton. She teaches creative writing in Statesboro, Georgia.